Back in May, I posted a photo of buds on a branch of a Royal Poinciana tree in my garden. The trees now are in full bloom, bearing masses of brilliant red-orange blossoms. In this wide-angle photo of my back garden, you can see the Royal Poincianas in the background. Today's photo shows what an individual blossom looks like. What a beautiful blossom that is. yes, iI agree, it is very beautiful, very vibrant. Wow! What a beautiful flower! Just exquisite. I enjoyed scrolling down the page too. I love your moon and clouds photo with that dramatic red in the corner. That is one extremely beautiful flower :)Perfect for Ruby Tuesday!! Oh my goodness that is lovely! What a glorious pic of a radiant flower! Love this! I can't imagine having an entire tree covered in these blossoms - it must be an incredible sight. The vibrancy of the colours make this truly a beautiful photograph. Splendid as a backsrop and exquisite up close! Hawaii certainly has much beauty!! Lovely portrait of a lovely flower. What a beautiful flower indeed! such vibrant color!!! What an exotic flower and well done..
Oh Wow, that is so beautiful! Had to close my mouth on that one! Have a blessed day! I like this photo, in the Macro. What appeals to me is the blurry background which enforces the attention needed to clearly view the artists intent. I miss an SLR, prior to the wheelchair, I used Pentax K1000 (all manual) and an 80-205 lens. It is wayyyy too heavy to handle these days, hope to have a digital SLR some day. Hello to all my Ruby Tuesday friends. Thank you for visiting and adding your comments. I appreciate the feedback. @ Ralph -- I hope you can get a DSLR camera soon. It's amazing how much lighter they are than the old SLR cameras. 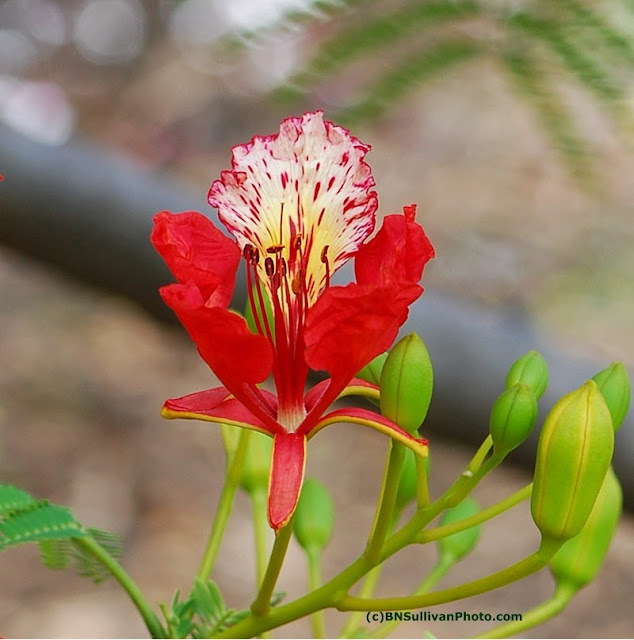 A lovely blossom and I've always loved the name, Poinciana! Happy Ruby Tuesday, Bobbie! I love seeing the poinciana in bloom. I live in SW Florida and I'm going to try and grow some from seeds someday. Mines up ♦Ruby Sunrise♦ click here! You make gorgeous pictures, I really enjoyed scrolling around here! A very beautiful flower, lovely colours ! Well captured with nice bokeh ! You had an awesome nikon lens ! Thank you all for visiting. I think I have managed to visit all your Ruby Tuesday posts, too. What a talented group this is! @ Tink - I wish I could send you some seeds. Our trees produce an over-supply of the seed pods every year. We have to gather them up and haul them away to the dump. It seems such a shame. 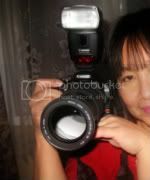 @ Jinghui - Yes, the Nikon 105.mm is my favorite for these kinds of shots. Such a pretty flowers. I'm almost flowerless in my yard right now and my heart just isn't in it. Keep up the good work with the yard, flowers and the photos. @ Patti - Thank you very much.